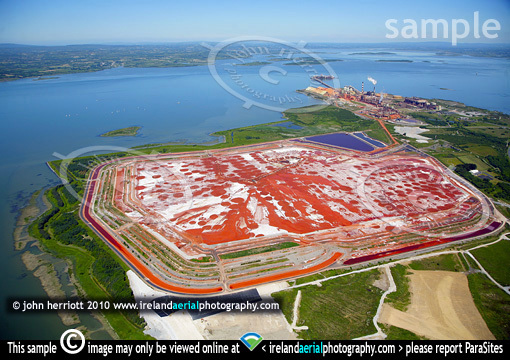 Aerial photo of Aughinish Alumina processed bauxite waste, Shannon river, Limerick. Aerial photo showing the alumina processing plant at Aughinish, County Limerick. This plant is operated by Rusal, a Russian company producing aluminium with a number of plants around the world. The large red area is bauxite processed waste currently covering an area of approximately 250 acres.